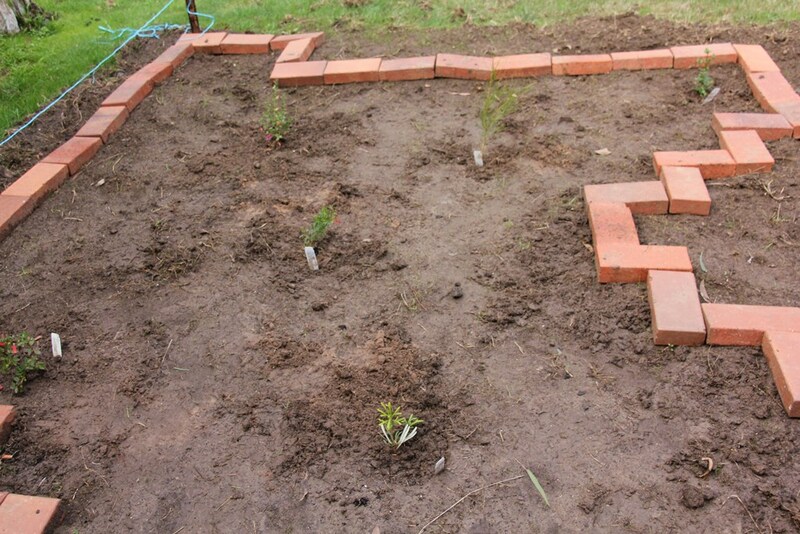 These tiny plants look lost in the new garden, but trust me, they will grow to fill the space! 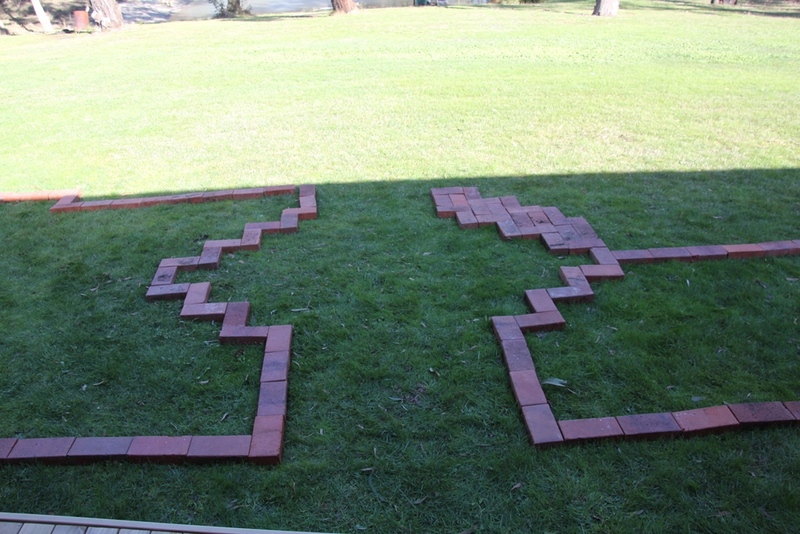 just over a year ago, I began to lay out new garden beds to construct a Honeyeater Garden. I’ve mentioned our new honeyeater garden in a few recent posts, so I thought I would tell you a little more about it. The idea began approximately a year ago, when I noticed that all of the flowering plants in our garden were not visible from inside the house. We had plenty of honeyeaters on our property, but never where we could actually see them. I began to imagine a low-growing native flower garden alongside the deck, and also visible from three rooms in the house. In addition to the new garden, I wanted to work out which native plants we already had in the cultivated parts of our garden. Many of the exotic plants which were outside our back yard had been wrecked by the Swamp Wallaby. We’d noticed it didn’t seem to enjoy eating native plants. Armed with a few books, including a wonderful guide to bird-attracting plants, I constructed a spreadsheet of plants which would attract the species of birds I wanted to see. Mapping out when each plant flowered, I tried to ensure we would have a few things in flower all year round. Here’s the list. Each coloured line indicates when the plant will be flowering and the colour of the lines indicates where I want to plant it, or where we already have one growing. The lines in pale yellow are the plants I haven’t been able to find in our local plant nurseries. So, you can see that one year on, there is still a lot of things to do. This is the list of Native Plants I came up with when researching bird attracting plants. The coloured lines indicate when each plant is in flower. Over the course of the last year, there have been many things which prevented work on the garden. Some of these were health related. Finding the plants on my list was another problem. However, with the help of friendly plant nurseries, we chose some natives which were similar to the ones I’d wanted, even if they weren’t exactly the same. Red Wings (Grevillea thelemanniana) a prostrate Grevillea which has red flowers is the central plant in both beds. This plant will cover a lot of ground and provide some good hiding spots for small birds. Honey Pots (Banksia Spinulosa) a low growing Banksia with large yellow flowers. Autumn Blaze (Correa Pulchella) a ground cover with pretty salmon coloured bell flowers. The Swamp Wallaby has already found this and finds it quite tasty, so it is still very small and doesn’t cover much ground. Pink Passion (Eremophila maculate) another larger shrub with, as the name suggests, pink flowers. Each of the above plants were selected for their attractiveness to birds and the month of the year they are in flower, so while they are all differently coloured flowers, they won’t all be in flower at the same time. We also plan to intersperse some white flowers through the garden. We will be planting more in the beds – especially more ground covers- and now that Summer is coming to a close, I am ready to get back into the development of the honeyeater garden. The water feature used by the Crimson Rosella for bathing is placed diagonally in between the garden beds. When the plants grow, the birds will have a safe drinking spot right in the centre of plants they feed from. There will be a part 2 to this post very soon. Since these photographs have been taken, we have planted a few more small shrubs and everything has grown so much over Sprig and Summer that it looks very different now! Nice to see the before shots, after seeing your latest posts on how the garden is developing. Good planning too to have plants in flower to attract the birds and insects through the year…. and Joey. Am interested in your plant list too… here i have a low growing grevillea, which has kept going for about 20 years. Interest to know what the cream mink protea flower looks like. Will you post a photo for me?